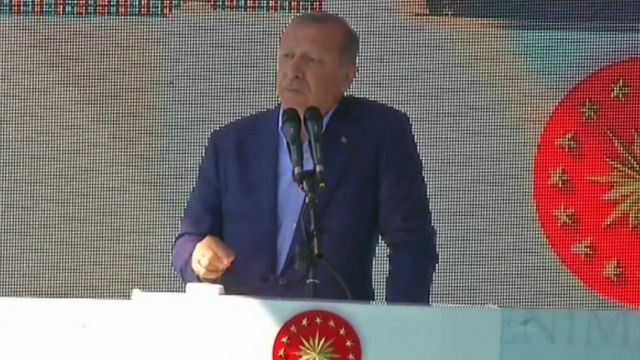 'Women without children are deficient' Jump to media player The Turkish President, Recep Tayyip Erdogan, has said a woman's life is "incomplete" if she does not have children. Women forcibly removed from protest Jump to media player Ecuador has protested to Turkey after three women were removed from an event in Quito at which Turkish President Recep Tayyip Erdogan was speaking. The trolling of Turkey's PM Erdogan Jump to media player Why did Turkey block YouTube and Twitter? #BBCtrending radio has some answers. Turkey lifts headscarf ban Jump to media player Turkey has lifted rules banning women from wearing headscarves in the country's state institutions - with the exception of the judiciary, military and police - ending a decades-old restriction. The Turkish President, Recep Tayyip Erdogan, has said a woman's life is "incomplete" if she does not have children. He apparently intended to encourage women to have babies and help boost his country's population. Selin Girit reports from Istanbul.